Mention the names Mike Joyce and Andy Rourke, even in the company of self-described music fans, and most people will present a confused look, followed by the question, "Who?". If, on the other hand, you drop Morrissey or Johnny Marr into a conversation, chances are that people around will nod in approval, and maybe slap you on the back in a moment of camaraderie. Morrissey and Marr were the poster-boy geniuses in The Smiths, while the band's rhythm section, consisting of Joyce on drums and Rourke on bass, only saw their names come to the fore with the filing of their very inflamed lawsuit against their former band mates over royalty money. Inside The Smiths is the title of a new documentary about this most influential of bands, with the lesser known Joyce and Rourke at its center. While The Smiths were and are an interesting and devoutly followed band, with an adequate rhythm section, the only note-worthy members continue to be the Moz and Marr. Positioned alongside the towering personalities of the band's two legendary front men, Joyce and Rourke have traditionally sized up as little more than two ordinary lads from Manchester, and although it presumably set out to re-scale that image, Inside The Smiths proves more than once that The Smiths' historically unbalanced portrait is more accurate than not. Throughout the documentary, creators Stephen Petricco and Mark Standley follow The Smiths' sidebar bass player and drummer as they walk around the streets where they grew up, paying visits to the places where the seminal band was first formed and listening as Joyce and Rourke reminisce about the rock star life, and how the fantasy finally fell to pieces. To put it frankly, neither Joyce nor Rourke are good story tellers, they're just regular guys who happened to end up in one of the greatest bands of all time; hence their recollections of their time in the band are not especially captivating. Which is unfortunate, as the pair would presumably hold the key to a treasure trove of insight into The Smiths - a band that has seen a bit of a resurgence over the past few years, from the unsanctioned Under Review to their lead-off spot on the genre-defining The Brit Box - but Inside The Smiths reveals nothing new. Aside from re-treading worn ground, the documentary's production values are nothing to write home about either. From the black and white footage of graves and shadows that opens it (a Brit rocker clich� if there ever was one) to the band's introduction by the "host" of the film, the lighting is bad and the editing even more so. It is of course not unusual for documentary filmmakers to slide by with poor production values, but in those cases the story has to be captivating. If the story is thin, as is the case with Inside The Smiths, the poor production values stand out like a pus-encrusted wound, and in the end that's all the viewer can focus on. 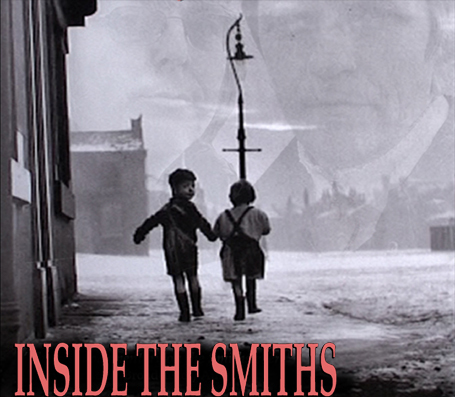 Inside The Smiths could have - should have - been a great documentary, and even though it offers next to nothing in the way of revelation it could have at least been passable had the production and editing been better. I have little doubt that a more astute director and a better production team could have found a handful of truly interesting stories within the backup sagas of Joyce and Rourke, but the sad fact is that they didn't. Watching Inside The Smiths, I couldn't help but notice how often I found myself reaching for the remote to skip ahead, only to find little of interest.